Ahead of the Fringe Festival starting in August, we caught up with Stuart Pyper, one of the three writers and performers of Bella Freak’s Unwritten performance. September 2016, just after the Fringe had finished. We were sitting in the office of Disability History Scotland, our most recent project just concluded, and Sasha Callaghan was already conniving to involve me in another adventure. This time, on stage. Our colleague, David Nicol, had recently performed an acclaimed one-man show, Chains on Sink Plugs, at the Forest Fringe. Sasha’s idea was that we team-up with David and put together a show on our three very different lived experiences of disability. I tend to push myself into things. Especially events and activities in the seemingly distant future, that I don’t have to worry about just yet. It’s how I cope. ‘Yeah, why not.’ And, after all, this did seem fun, if somewhat unlikely. Then again, being disabled is a constant source of drama, intrigue, sheer bloody mindedness, and laugh-out-loud absurdity. We get to see the world at its worst and its best. Every day. Our lives have a pretty strong in-built narrative. From this off-the-cuff agreement, a plan developed. We wanted to stage a proper show, that was fully part of the Fringe, and one that was accessible as possible to audience members with disabilities. This meant obtaining funding. Through Disability History Scotland, we applied for a grant from the Heritage Lottery Fund, and were very fortunate to receive £10,000 from their Stories, Stones & Bones initiative, as part of the Year of History, Heritage, and Archaeology. Without their support, this show would not have possible. The process has been challenging, and very much not ‘not terribly difficult.’ We started with a research phase, where each performer explored the histories of their specific disabilities, and its context within national culture. There followed a writing development phase with Scottish BAFTA winner Jane Livingstone (her most recent play, Jocky Wilson Said, runs at the Gilded Balloon during this year’s Fringe) where we developed our personal experiences and research findings into a fully fleshed out script. We then entered rehearsals with our director, Sara-Jane McGeachy, shaping our words into visible thoughts and actions, preparing for our first performance at the start of August. All this, not to mention venue hire, music licensing, poster and flyer design, arranging a BSL interpreter and closed captioning… It’s been a lot of work. But it’s worth it. Unwritten matters because disability history and culture, while for the benefit of everyone, should be in the hands of those of us with disabilities. All too often, it isn’t. But Unwritten is, and our show bridges two organisations with this intention at their hearts. Disability History Scotland is a community-based disabled people’s organisation focused on the preservation and promotion of disability heritage and culture. It previously completed All Together Now, a project focussing on experiences of disability after WWI, and is currently undertaking Justice Not Charity, a study of the Scottish history of the National League of the Blind March in 1920. 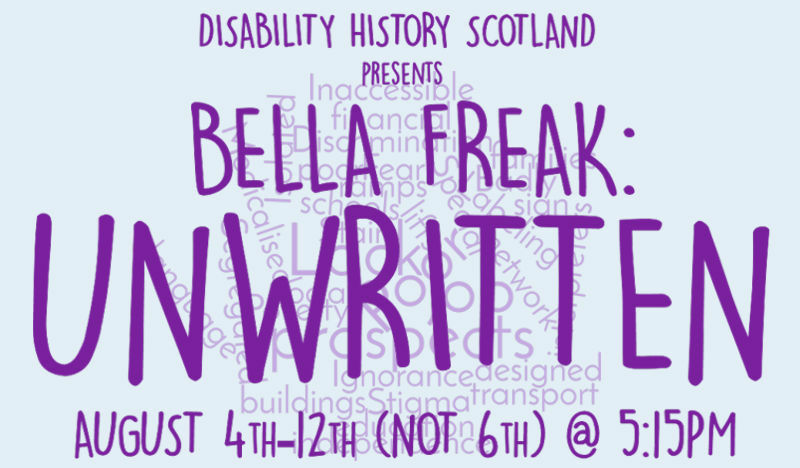 Bella Freak was established with the long-term goal establishing a fully-accessible inclusive arts festival to be held annually in Edinburgh. It held a round table discussion in 2016 to discuss creating inclusive festival events, and has conducted a further research study to identify disabled persons’ unmet needs when accessing cultural events, whether independently or with other people. On what’s next, for both organisations… watch this space. Unwritten is thought provoking but we hope people also find it funny and surprising. We also hope disabled people in the audience will be nodding their heads in recognition. For more information, performance times or to book your ticket, visit the Edinburgh Fringe website. Interested in seeing what other disability related and accessible performances are taking place throughout August? Check out our Accessible Performances during Edinburgh’s Festivals feature.